Transparency Market Research (TMR), a U.S.-based market research and intelligence firm, has recently published a new market research report. The report provides an in-depth analysis of the global prebiotics in animal feed market, including market segmentation, historical data regarding the performance of the market, and the market’s growth prospects. The research report is titled “Prebiotics in Animal Feed Market - Global Industry Analysis, Size, Share, Growth, Trends and Forecast, 2013 -2019”.According to the research report, in 2012, the global prebiotics in animal feed market stood at US$213.9 million and is estimated to touch US$461.3 million by the end of 2019, growing significantly at an 11.9% CAGR from 2013 to 2019.Tremendous rise in meat consumption across the globe, ban on using antibiotics in animal feed, and several health benefits of prebiotics for animals are some of the factors expected to boost demand for prebiotics in animal feed in the forecast period. However, strict regulations and greater market visibility for prebiotics are the restraining factors that could hamper the growth of the global prebiotics in animal feed market in the near future. On the basis of the animals to which they are fed, the global prebiotics in animal feed market has been segmented into cattle, aquaculture, swine, poultry, and others. Poultry and cattle are termed as the most lucrative segments. In 2012, in terms of volume, poultry and cattle collectively accounted for 60.8% of the market, out of which poultry held the larger share. 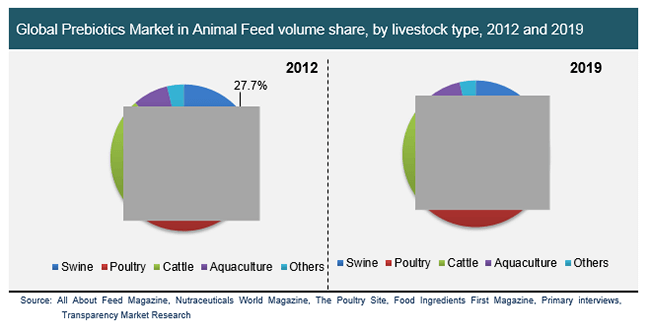 The poultry segment is also expected to dominate the global prebiotics in animal feed market in the coming years. In the same year, the aquaculture segment accounted for 7.8% of the market; however, this segment is .estimated to lose its market share in the forecast period owing to the decline in aqua feed oxidation.Geographically, the research report has segmented the global prebiotics in animal feed market into Asia Pacific, Europe, North America, and Rest of the World. In 2012, Europe dominated the global prebiotics in animal feed market, holding a market share of 40%, and the region is expected to continue as the global leader through the forecast period. The dominance of this region can be attributed to the ban on antibiotics in animal feed. The Europe market is also expected to grow at a rapid pace in the near future, accounting for almost half of the market by the end of the forecast period. In 2012, North America and Asia Pacific collectively held close to 44% of the prebiotics in animal feed market. By the end of 2019, Asia Pacific is estimated to acquire nearly 30% of the market, leading to a drop in the market share of North America. RoW is expected to experience a marginal growth of 0.2% in its share in the global market and end up taking up 7.4% of the global market by the end of the forecast period. Furthermore, the research report has provided a comprehensive analysis of the prominent players operating in the global prebiotics in animal feed market, including the key facts, business overview, financial overview, business strategies, and recent developments in the industry. Some of the players mentioned in the research report are Abbott Laboratories, Cargill Incorporated, BENEO-Orafti SA, and Cosucra-GroupeWarcoing SA.